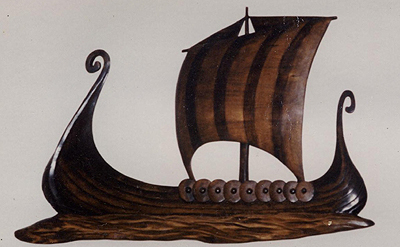 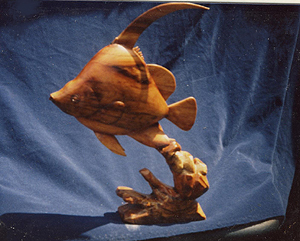 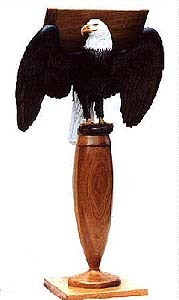 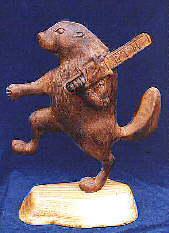 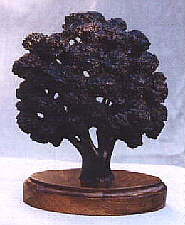 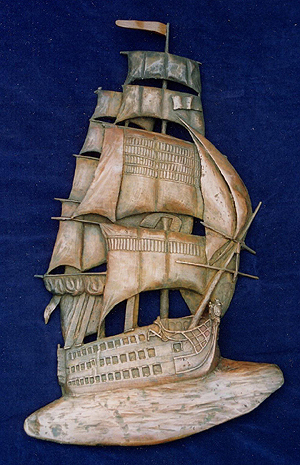 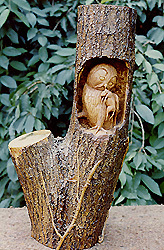 Ian Brennan; Realistic detailed Woodcarvings and bronze sculpture by contemporary sculptor Ian G Brennan. 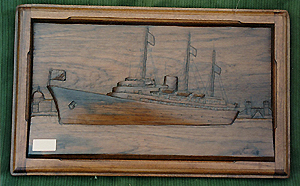 Outlined here is just a small example of the bas-relief and three-dimensional wood carvings and bronze sculpture Ian G Brennan has created during the past two decades and although many of his commissions particularly for the Royal Household may not all be shown on this website it does however give a rather good idea of the wide variety of both heraldic and realistic commissions in many different mediums that sculptor Ian G Brennan has produced during these years. 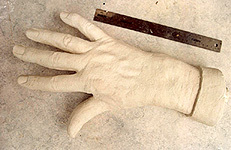 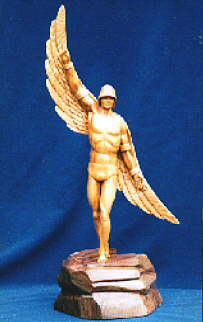 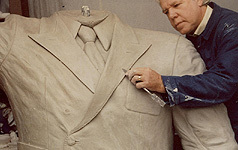 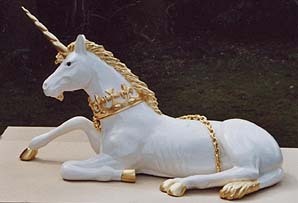 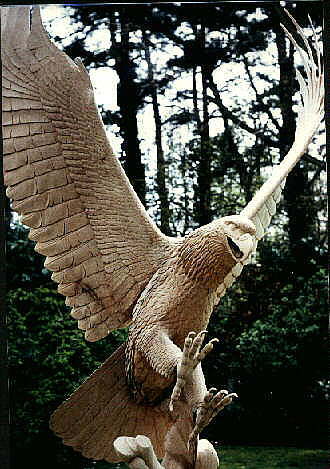 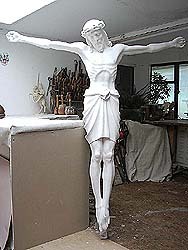 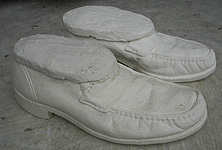 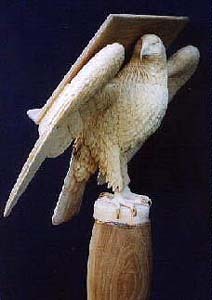 Ian G Brennan has been a professional sculptor since 1984 and is one of those rare sculptors that both carves and casts. 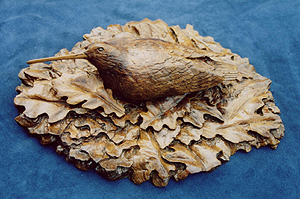 The majority of Ian's work is involved with producing one-off both realistic and heraldic bronze sculptures and wood carvings in both three dimensions and bas-relief, with the wood carvings often being carved from a single piece of wood. 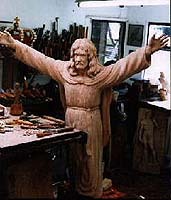 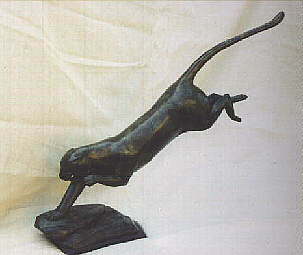 Ian first began casting his work in bronze and occasionally silver in 1996 and when he is not producing the master copy directly from plaster or clay he frequently uses his original wood sculptures as the master copies for his bronze sculptures. 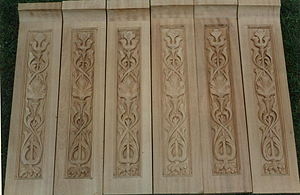 Outlined here is a just a small sample of the wide variety of diverse projects Ian has also been involved with over the years. 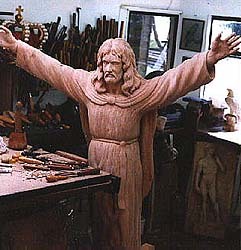 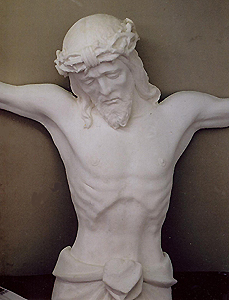 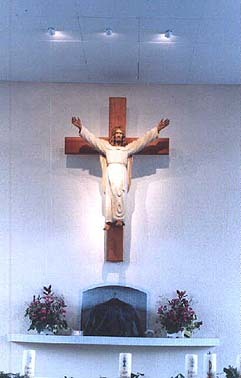 These commissions are as diverse as carving a 10 feet high statue of a Bald Eagle from a single piece of wood for an American Corporation, to carving a life size statue of the 'Risen Christ' for a local Church. 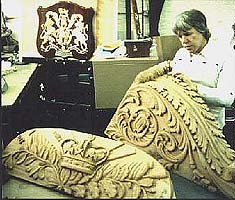 Producing the International Cup Final Trophy for the Scotland V Barbarians Rugby Final, to carving a massive wood sculpture of 'The Globe' from a centuries old Redwood tree. 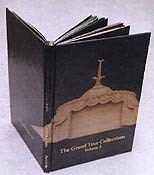 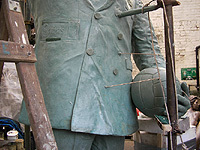 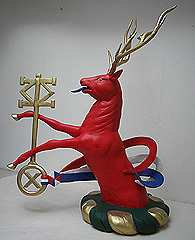 Photographs of Ian's sculptures have even been used for more unusual projects such as book covers and limited edition prints. 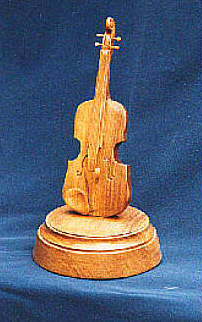 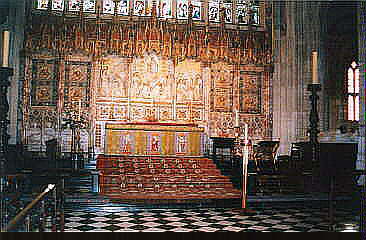 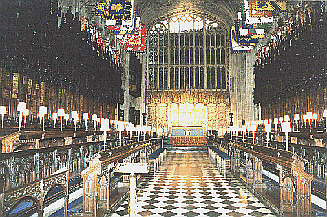 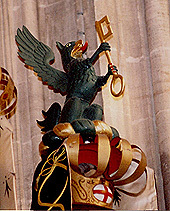 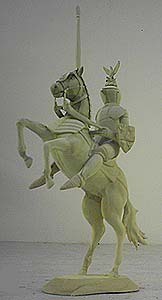 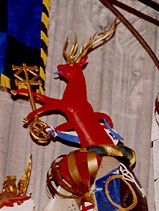 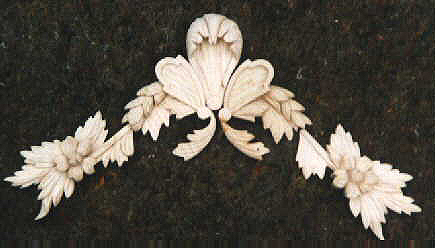 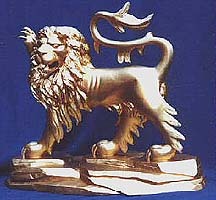 The Pascal Candle Stand commissioned for the High Alter in St George's Chapel Windsor Castle. 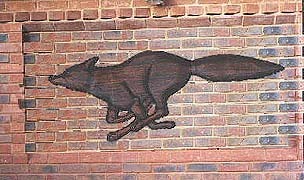 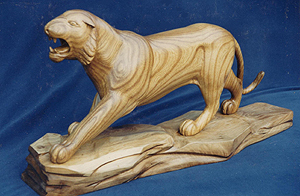 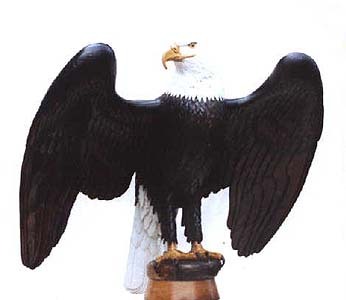 Specialising in detailed wildlife woodcarvings and bronze sculpture which are produced either as a one-off or in a limited edition. 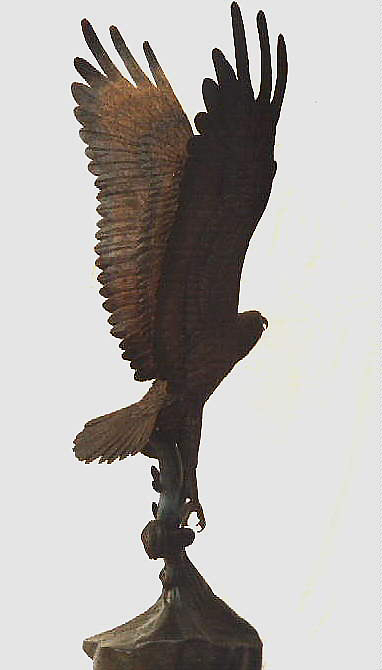 All four of these bronze sculptures shown above, were originally carved from a single piece of hard wood, moulded and then cast in bronze. 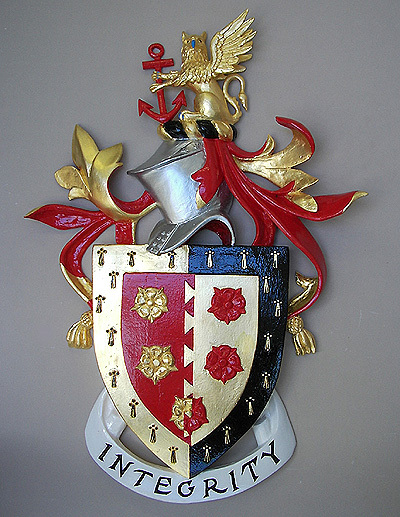 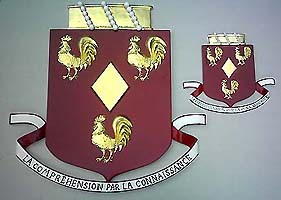 Ian G Brennan's Heraldic commissions are for not only private clients but also the British Royal Household. 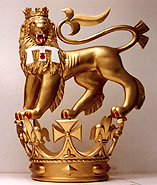 Coats of Arms and Crests designs include producing traditional Crowns and Coronets, Regal Lions and Mythical Unicorns to the more realistic Animals and Birds, for Heads of State and Leaders in Business, as well as those for the Nobility and both British and European Royalty. 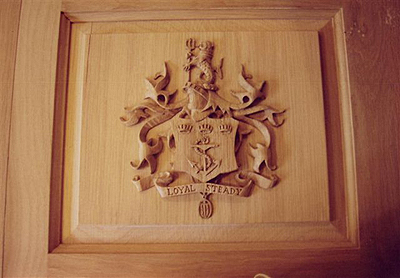 Ian recent commissions for the British Royal Family have included three carved Royal Crests for HM The Queen's sons Prince Andrew, The Duke of York and Prince Edward, The Earl of Wessex and also the Queen's grandson HRH Prince William. 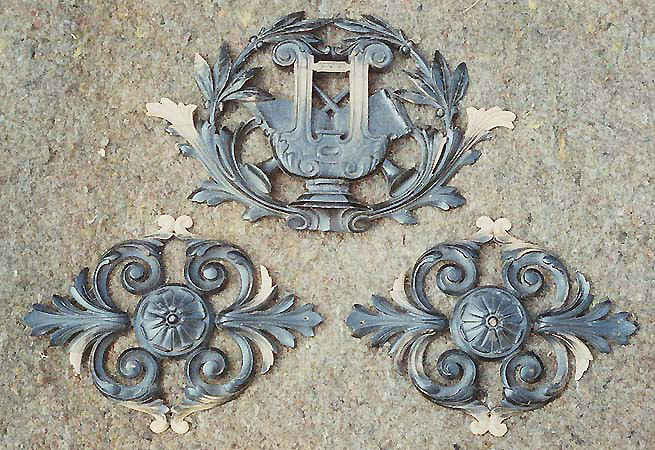 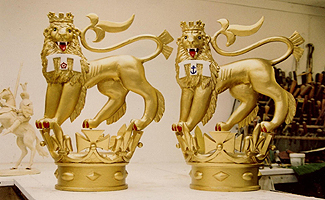 These three similar carved and gilded Royal Crests were for the most recent Royal Knights to be awarded the highest and oldest Order of Chivalry the Most Noble Order of the Garter. 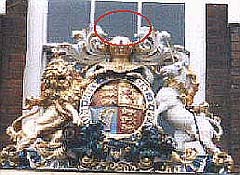 These almost identical Crests recognises their seniority within the Royal family joining their mother, The Sovereign HM Queen Elizabeth II, father Prince Philip, The Duke of Edinburgh, brother Prince Charles, The Prince of Wales and sister Princess Anne, The Princess Royal. 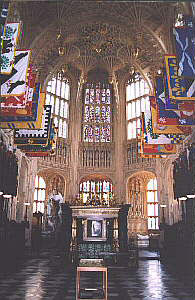 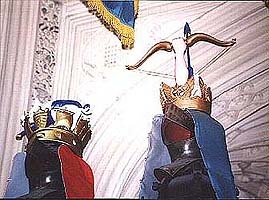 Four of the over eighty Knight of the Garter and Knights of the Bath, Crowns, Coronets and Crests carved by Ian G Brennan in St George's Chapel in Windsor Castle and Henry VII, Lady Chapel in Westminster Abbey. 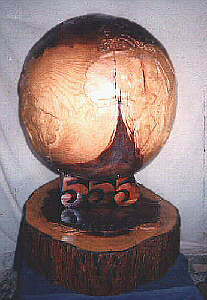 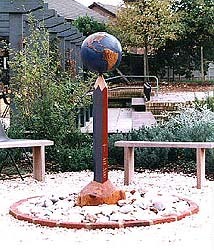 The 'Globe' Sculpture carved from within the trunk of a 250 year old Sequoia Tree. 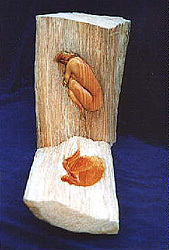 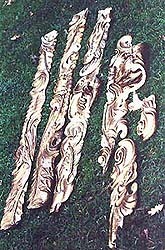 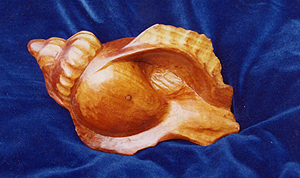 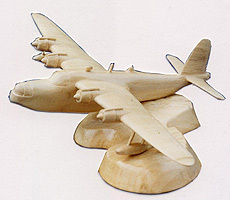 This carving is on display in the foyer of the headquarters of an International Corporation. 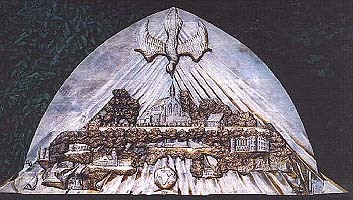 Bas-relief carving showing various landmarks of a village in Hampshire UK which is now placed above the Vestry in St Mary's Church Warsash. 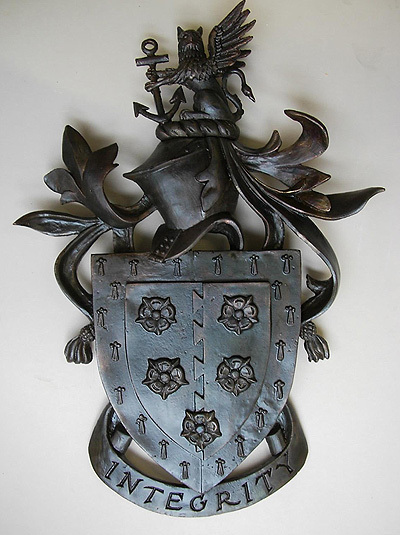 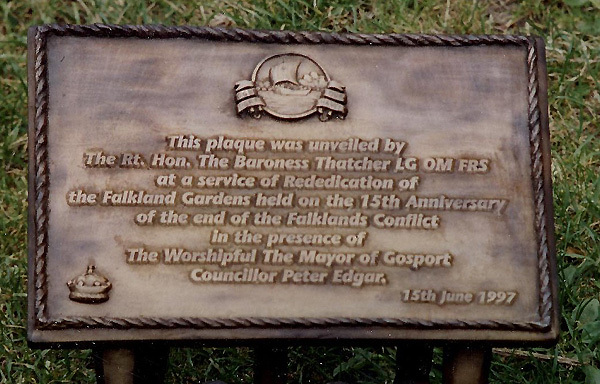 A centuries old original wooden shield for a Knight of the Garter that was caught in the fire in St George's Hall in Windsor Castle in 1992. 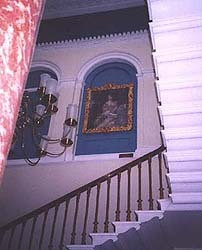 This fire damaged shield which was rescued from the walls of St George's Hall once had a medieval Garter Knights Coat of Arms painted upon the shield but this painting was subsequently erased in the fire. 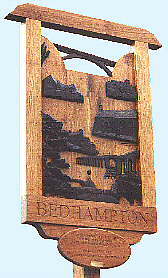 Ian has now produced a relief carving depicting firemen fighting the fire which raged throughout the night through the Brunswick Tower at Windsor Castle. 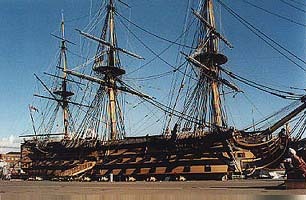 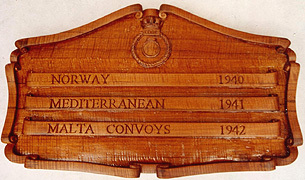 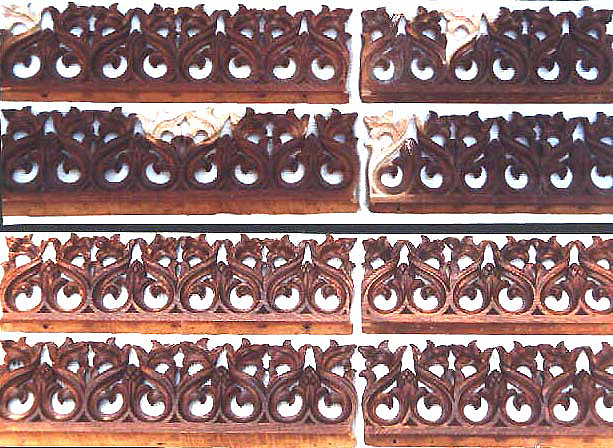 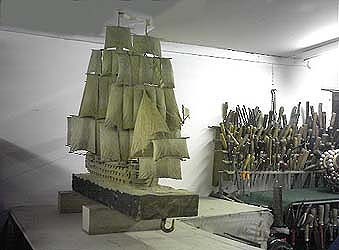 A selection of the projects from the Museum Service and The Ministry of Defence in the UK, These restoration projects often vary from carved all the intricate scroll work on Lord Nelson's historic Flagship HMS Victory, and 'Southwick House' the former Allied Headquarters of General Eisenhower during WW 2. 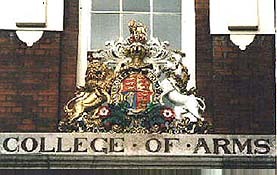 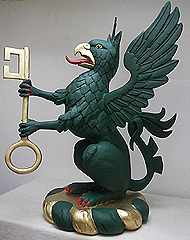 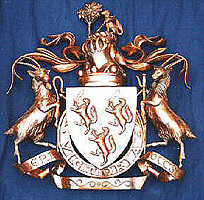 Restoring the Royal Coat of Arms at the College of Arms in London. 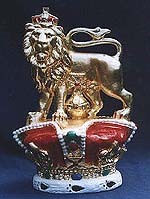 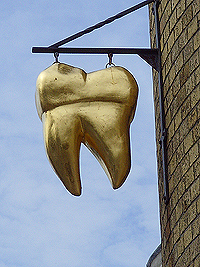 This replacement Royal Crest was initially carved from wax and then cast in bronze prior to being painted and gilded. 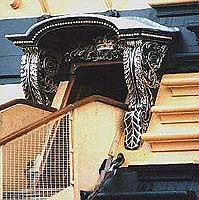 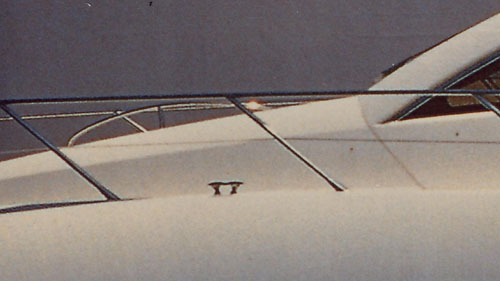 The carved Scrollwork on HMS Victory�s Starboard side Entrance Port. 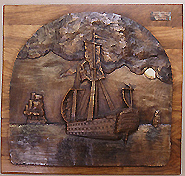 Sculpture of ' Trafalgar Day 1805' currently being carved by Ian G Brennan from original oak from the HMS Victory's lower gun deck removed during the restoration program. 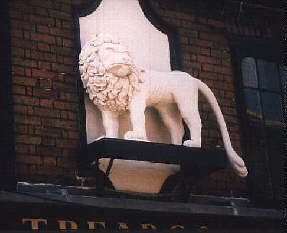 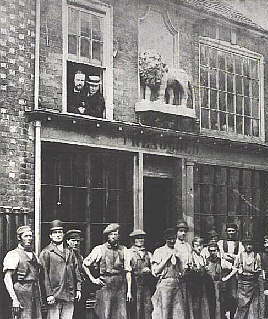 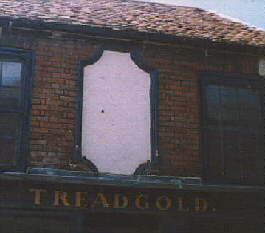 Using the only information available this old photograph as a guide, Ian carved this replacement 18th century stylised lion figure-head which had been placed above an old hardware store, which is now a museum in Portsmouth UK. 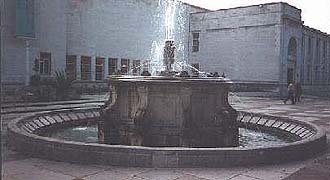 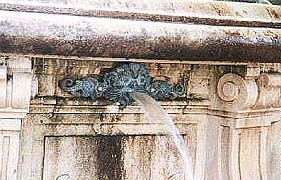 Again using an old photograph as a guide Ian this time was commissioned to produced eight exact replicas bronze water spouts to replace those lost on this 19th century' Rose Fountain' in Southampton UK. 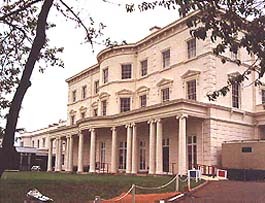 Southwick House, now the Wardroom in HMS Dryad near Portsmouth in Southern England was requisitioned by the Royal Navy in 1941 from the 'Thistlethwayte' family to become the forward planning and operational Headquarters of the Supreme Commander of the Allied Expeditionary Force, General Dwight Eisenhower and the Naval Commander for Operation Overlord, Admiral Sir Bertram Ramsey. 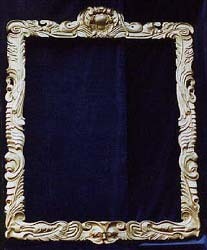 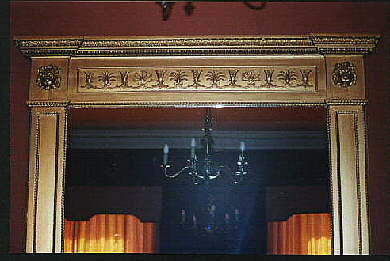 Southwick House had recently undergone a major restoration program and during this restoration Ian was commissioned to restoring some of the ornately carved antique mirror and picture frames inside Southwick House. 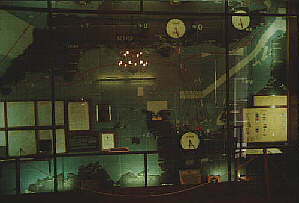 The original D Day Map in Southwick House still set at 'H' Hour June 6, 1944, when the Allied invasion of France began. 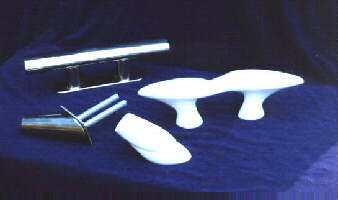 A mould was produced from Ian's original wood carved and painted cleat and stanchion socket, both have now been produced in stainless steel for the 'Sunseeker' Super Yachts. 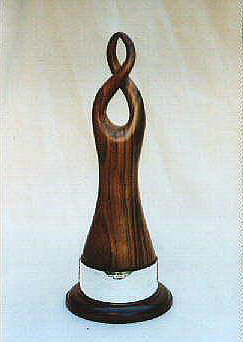 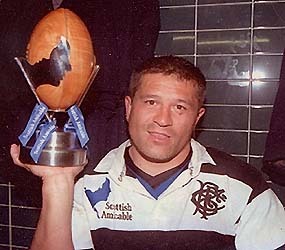 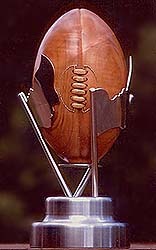 Rugby Ball trophy commissioned for the winner of Scotland V Barbarians Rugby Cup Final at Murryfield, carved from Cherry Wood. 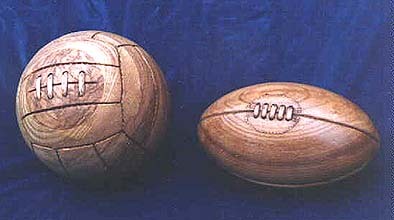 A full size older style Football and Rugby Ball ; Both carved from Ash wood. 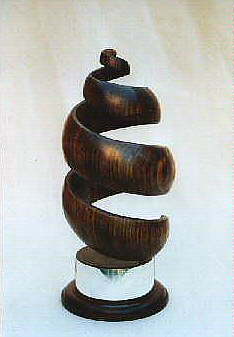 Various commissioned trophies carved from Walnut for the Hampshire Business of the Year Awards.